Eleven-year-old Karla Ortiz spoke this week at the Democratic National Convention, addressing the needs of children of immigrants. She was joined by her mother Francisca. In my work as an advocate, I’ve had the opportunity to witness several children, some as young as five-years-old, share their family’s immigration story in an effort to influence policy change. Every single time, I’m moved and inspired by the courage and determination of these young leaders. These are children who have grown up in an era of youth grassroots mobilization, following in the footsteps of their undocumented older siblings, the “DREAMers.” They are referred to as the “5.5 million children who live in mixed-status families.” They comprise a significant percentage of children in our K-12 system (as high as 17 percent in states like Nevada), and the vast majority are U.S.-born citizens. But most importantly, they represent future voters and workers, and they are already making their voice heard on critical matters that directly impact them, like immigration policy. 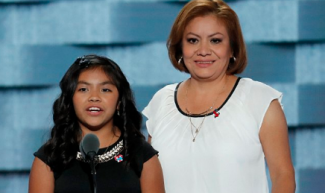 That’s why when Karla Ortiz, an 11-year-old U.S. citizen child from Nevada, took the prime time Democratic National Convention (DNC) stage last night alongside her undocumented mother, Francisca Ortiz, I shed tears just thinking about how far our movement has come. Karla shared her story with America, talking about growing up with the “weight of the world on her shoulders” because she lived in constant fear of her parents being deported one day. She stated, “I don’t feel brave every day. On most days I’m scared that at any moment my mom and my dad will be forced to leave.” She also shared her dream of one day becoming a lawyer, and defending other families like hers. Sophie Cruz, age 5, delivered a letter to Pope Francis last fall asking him to make sure her parents weren’t deported. Karla joins several other children who over the years have taken a stand for their families, as our immigration policy too often fails to consider their best interests. Last year, when the Pope made his visit to the U.S., Sophie Cruz made headlines by bypassing barricades to deliver a letter to the Pope asking him to urge Congress and the president to legalize her parents, and later became the “face” of the million of U.S. citizen children who have so much at stake in the future of immigration reform. 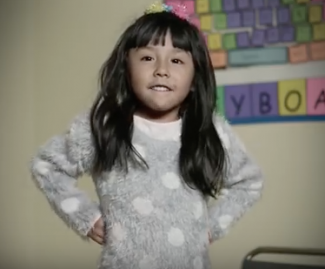 Earlier this year, First Focus launched the My American Story Public Service Announcement (PSA) campaign, which features five U.S.-citizen children from around the country, all who have either lost a parent to deportation or live with the risk of separation every day. The television and radio PSAs are currently airing in 9 states, and several other children have contributed their story to the website, which will continue to provide a platform for children who want to have their own voice in this critical debate. Five-year-old Zury, one of the young activists featured in the PSAs, asked this question of policymakers, “How do they not know that all kids need parents?” Her brother Roberto, age 9, actually slept outside the Supreme Court alongside his mother this past April in the days leading up to the oral arguments in the case blocking the deferred action program that could have provided his family the stability they have been waiting for. 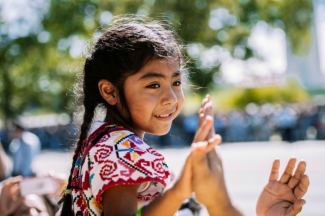 Zury, age 5, is featured in This Is My American Story, a multi-media campaign raising awareness of the challenges faced by children of immigrants. The stakes are very high. Due to the recent Supreme Court indecision in the US vs. Texas case, children in mixed-status families are left in limbo waiting to see when relief might come for their families, whether it be through administrative or legislative reform. All eyes are on the presidential election, where proposals have spanned the spectrum of banning birthright citizenship and mass deportation to expanding deferred action and ending family detention. The next president will help define the kind of country our children will grow up in for the next 4 to 8 years, and whether U.S.-citizen kids like Karla, Sophie, Zury, and Roberto can finally just be kids and stop carrying a such heavy weight on their shoulders. Please consider signing on to our petition calling on the president to stop deporting parents. To learn more about the My American Story campaign, please visit the campaign website.